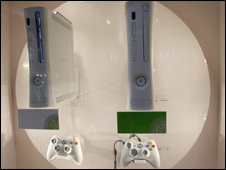 British broadcaster Sky has struck a deal with Microsoft that will see live football, TV and film content brought to the Xbox 360. The deal marks the Xbox's first move into live linear broadcast TV. Rival consoles, Sony's PlayStation 3 and Nintendo's Wii, can access catch-up TV content via the BBC's iPlayer. Sky's channels will be available on the Xbox 360 from the autumn, but no specific line-up or pricing details have been given. Users of Microsoft's Xbox Live online service on the 360 in the UK and the Irish Republic will be able to watch Sky's live sport, programmes, catch-up TV and on demand films, without the need for a satellite dish or set-top box, or being an existing Sky customer. Sky's commercial group director Stephen Nuttall hinted there could be deals for some current Sky subscribers. Sky customers who have subscribed to premium content packages, or have multiple set-top boxes or one of the bigger broadband packages could get content via their Xbox at a reduced cost. Neil Thompson, head of Xbox for UK and the Irish Republic, said: "The entertainment world is changing immensely, with consumers looking for choice, flexibility and convenience. "They also want to experience community elements." The line-up of channels and content available via the Xbox would be similar to the existing Sky Player service, available on PCs and Macs, said Mr Nuttall. Xbox Live users will also be able to watch Sky content together virtually, chatting over the broadband connection, and sending messages via their avatars, or virtual personas. The community viewing aspect will start with sport broadcasts, and could potentially roll out to other live TV content as well. Mr Nuttall said Sky on Xbox was an "extra convenience, a choice; it's a complement and alternative to the existing methods of experiencing Sky's content". Currently, users can get content via a satellite service, a PC service and a mobile service, either separately or in combination. Sky has 9.3 million subscribers in the UK, and the firm said "hundreds of thousands of people" were using its online Sky Player regularly. Microsoft would not say how many Xbox 360 users it had in the UK, or how many Xbox Live subscribers. The video content from Sky will be streamed in standard definition, "DVD quality" and will require at least a one megabit per second connection. Mr Thompson said the deal with Sky did not rule out the BBC's iPlayer ever appearing on the Xbox 360. Mr Nuttall said putting content on the 360 did not signal the end of the set-top box. He said: "It's about the expansion of choice. The Sky Plus HD box has got a lot of distinct features that distinguish it from any sort of competition, including the Xbox 360."